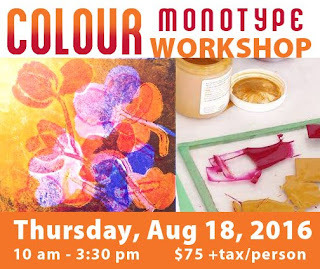 On August 18th, I returned to Visual Voice Fine Art in Truro to teach the Colour Monotype Workshop. As expected it was a lot of fun and all 5 participants enjoyed it thoroughly. First major field trip for my not quite so little table top etching press. In this case more like a "pedestal-top". Little sample prints for this workshop. Inks, rollers and all that ready for action. Corinne brought beautiful plants from her garden for her Monotype experiments. 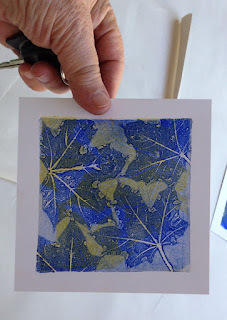 She also made a three layer Monotype with the reductive wiping method. Rosemary experimented with cut paper pieces to print silhouettes of birds onto a blue background. 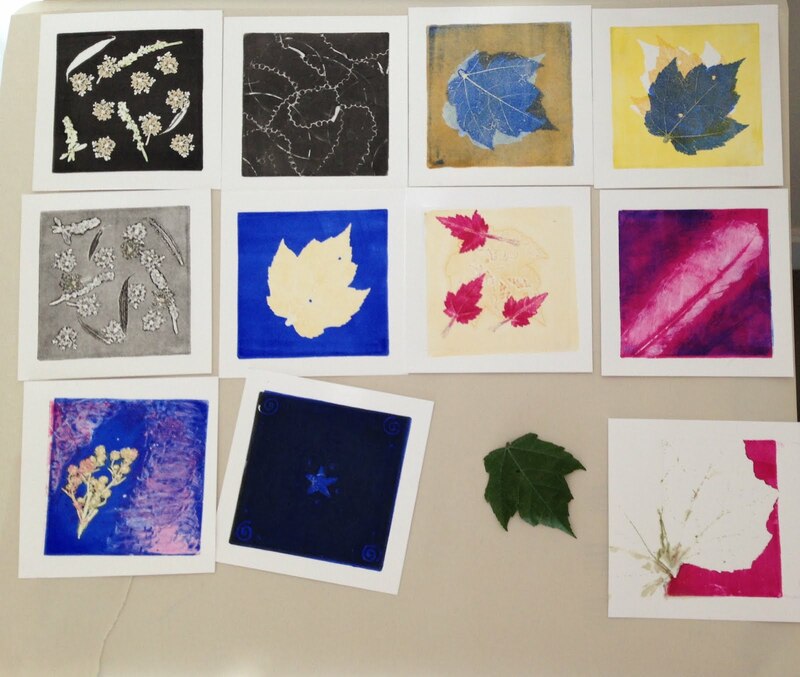 Victor is working on many beautifully composed monotypes. The various foliage he borrowed from Corinne turned out like a small forest. 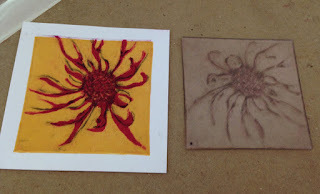 Rachelle came up with some innovative techniques, including rolling a golfball around on a plate to create unique marks. Harmonia is a big fan of Maple leaves, she made them part of all of her prints. Corinne enjoyed experimenting with all the little treasures she brought from her garden. Overall it was a big success and a lot of fun. Thank you to everyone who so enthusiastically participated and of course thank you to Visual Voice for hosting the workshop. Nuri did a great job taking many of these photos. Thank you Nuri!